Are you a horse or unicorn or dolphin girl? Recently, I read an NPR article that explained girl power is the reason why so many girls love horses and dolphins and unicorns. In the article there was a quote by Laurel Braitman, an MIT graduate student in the history of science who writes about animals and what we think about them. She says girls’ fascination with these animals is more than power — the animals fuel girls’ imaginations. Apparently, each animal symbolizes how we view relationships and using our power. Horses: Horses are all about control, about harnessing and taming our masculine energy. About charging forward in the world at a sure-footed pace. Also, horses are loyal, steadfast, and true, qualities that appeal to our relational nature. 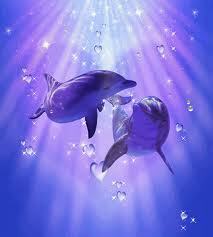 Dolphins: Dolphins are sleek and sensitive, about following your instincts and following them quickly. They are constantly pushing or pulling, in tune with the tide. And they live in water, which typically represents emotion. Unicorns: It’s not all about the horn. Unicorns also represent mystery, spirituality, beauty, hope, uniqueness, and purity. The unicorn is all about what you can become. What has not yet been revealed to you, but what is waiting just around the corner if you believe. So which one are you? Or did you give that up when you grew up? September 2, 2011. Tags: dolphins, girl power. dolphin girl. This blog post was fun and inspiring! Here’s to girl power! September 2, 2011 at 8:24 pm. Permalink. September 3, 2011 at 12:10 pm. Permalink. I guess dolphins would be my fave. But if the unicorn or horse was a Pegasus at the same time, now that’s a tough call. I do so love the idea of wings! September 3, 2011 at 12:40 pm. Permalink. September 3, 2011 at 12:59 pm. Permalink. September 3, 2011 at 4:26 pm. Permalink.